„Why the hell did you decide to go to Slovakia? “, many Germans asked me when I told them about my plans to go one year abroad. I often had problems to answer this question because there were many reasons why I decided to put Slovakia on my wish-list. One of them were the mountains and hills because in Germany it takes a long time for me and my family to go to the mountains. Another reason was that I wanted to go south but also wanted to see a cold winter again…we don’t really have it on our part. After we arrived to Bratislava (after a long journey by train), some volunteers came to pick us up and brought us with the luggage that weighted around 40 kilos to the hostel in that we had our post-arrival orientation. 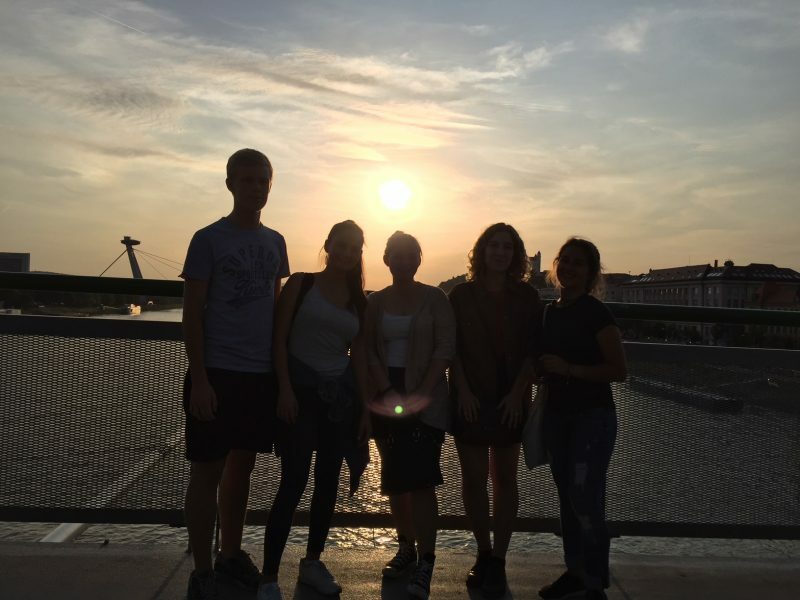 In those days of the orientation, volunteers and workers from YFU Slovakia showed us Bratislava in a city tour, showed us traditional Slovak meals and food and told us a lot about Slovak culture. After that, the host families came to the YFU office to pick us up. Sadly, my host family was still on vacation so I went with a YFU worker to live for two days with her family until my „real“ host family returns. 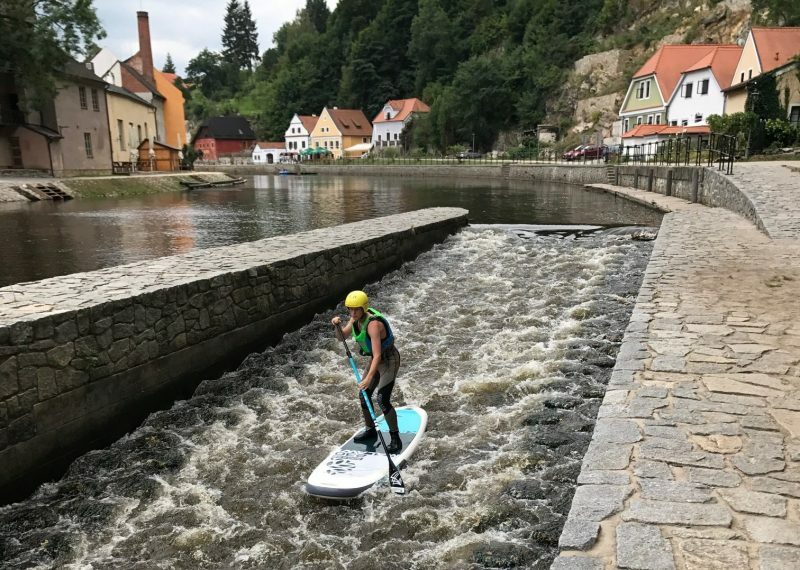 After they came back I went with my host mother and older host sister to the Czech Republic to go stand up paddling there. Because of this hobby of my host mum, we sometimes went to races for example to Košice, in shich she, and sometimes even I participated! I really enjoyed these days of doing this rather unusual but funny and interesting sport. After we came back to Bratislava the school already started. I was pretty excited when I met my new class the first time. Surprisingly we didn’t meet in school, we meet in a park. After speaking to my class teacher I also understood the reason why we didn’t meet in school: The school was still getting reconstructed. Because of the reconstruction, we made trips every day for a whole month because it was impossible to study in school while it was reconstructed. We went for example to a science marked, museums or for paddling. All in all, I was very happy about this first month of school, because I already saw many parts of Bratislava that I haven’t seen before and had a more convenient opportunity to find friends. After this first month of school (that I would rather consider as another month of the holiday), the school slowly started. The time in the school lessons I mostly used for learning Slovak, because I really understood nothing. The teachers were also happier than I thought because almost no one of them was able to speak English. Even though I didn’t understand what the teachers said, I noticed that the way they taught is different than in Germany. In Slovakia, the teachers speak more in the lessons while in Germany the students speak more. In a nutshell, you can say, that the lessons in Slovakia are way more frontal. Also, in Germany is no flag and coat of arms hung in classrooms. After a few months already Christmas came. Somehow I wasn’t homesick at all and was able to enjoy my first Christmas apart from my family in Germany. It was very funny and a kind of challenge for me to pretend my little 4-year-old host sister that „Ježiško” still exists. After the new years eve that I spent with friends, we went for a little ski trip to the Czech Republic again. 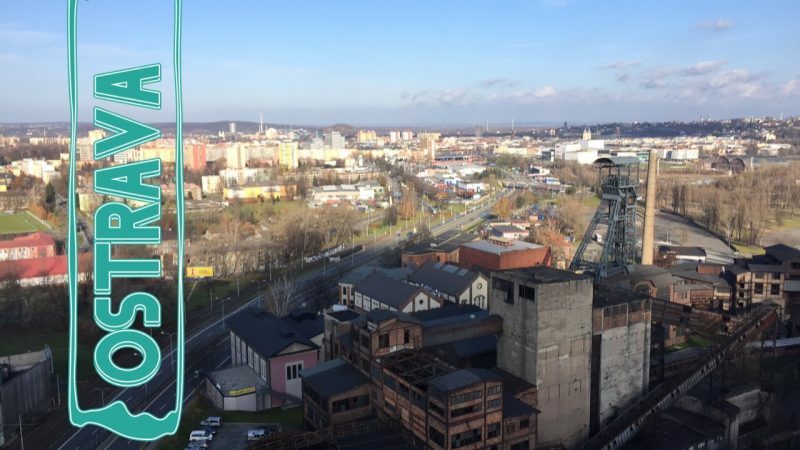 A big part of my exchange year also happened in the Czech Republic, because of the fact that my host dad is a Czech, his parents live in Ostrava and we visited them plenty of times. #1 V Nemecku som nikdy nevidel rožky. Jeme žemle. #2 Žiadná nemecká dedina nemá rozhlas. #3 Študenti a dôchodci v Nemecku musia niečo zaplatiť vlak keď chcu ísť niekam vlakom – na Slovensku majú vlak zadarmo. #4 Slováci vždy nosia doma/v škole papuče…Nemci nie. #5 Nemecké obchody nie sú otvorené v nedelách. 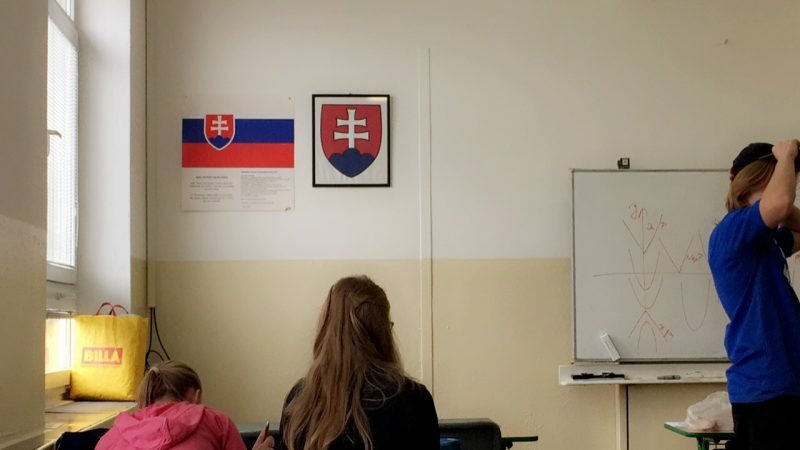 #6 Veľa Slovakov má iné mená. Napríklad v Nemecku žiadný Martin by nebol volaný Maťo. #8 Slováci jedia viac polievky ako Nemci…hlavné cesnakovú polievku. #9 V takmer každom slovenskom chliebe je rasca. Stále nerozumiem prečo. #10 Slováci používajú “jaaj” keď dostanú nápad. Nemci by používali “ahh”. #11 V Nemecku meniny neexistuju. #12 Maturita sa volá Abitur v Nemecku. Now after all these months I really can say that I found a second home and I really don’t know how I should feel about the fact, that I will leave this country in a few weeks. I don’t know if I should be more happy about being back in my „real“ home or that I should be sad about leaving the ugly but cool city of Bratislava. To be honest I noticed while my exchange year that I prefer to live in a city. But that’s how life is: I have to go home and will never ever have the opportunity to live this whole awesome year again but the memories in my mind will hopefully stay for my whole life. Please držte mi place, that the culture shock in Germany won’t be too hard for me!